Good grief! It’s been since January! No wonder one of our guests mentioned that our blog “needs a bit of updating”! Life is good at The River Nest! With summer comes boat traffic: barges, the channel dredge, campers on the sand bars, fisherpeople and cruisers. Always something of interest is moving on the river. Eagles are still around too. The blue heron have joined them as have all our summer birds. Bill is still filling the feeders for cardinals, bluejays, goldfinch, orioles, hummingbirds, red wing blackbirds, and an array of woodpeckers. The woodpecker below (Bill could tell you what kind. He’s our bird expert.) 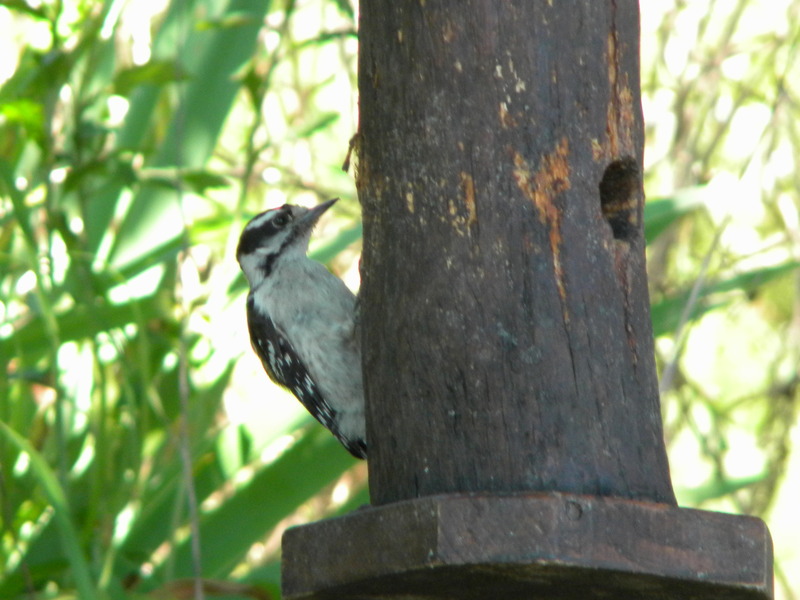 enjoys the homemade peanut butter feeder. We have a mulberry tree which drew a flock of cedar waxwings for a couple days in early July. We have a new attraction in the area: Danzinger Vineyards. 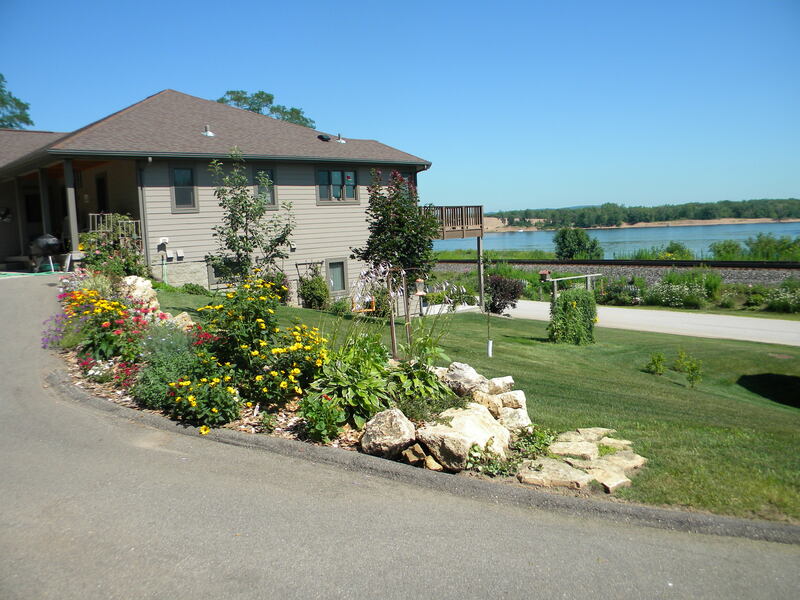 Generally we recommend our guests visit Buena Vista Park on the bluff above Alma, Wisconsin. In June they came back telling about the wonderful vineyard. So Bill and I decided to “scope it out.” It’s a beautiful facility with amazing views of the Mississippi valley. The wines are good too! Bill and I finally went on a cruise with Dan Miller at Big River Adventures. Now we really recommend it! We toured backwaters, saw eagle nests and the chicks (Is that what they’re called? ), blue heron, a mix of river birds, and some “cow” lilies. Dan promises to call us for the boom of the river flowers. It was great to see how much the river has “cleaned up” as we looked down into clear water and watched the fish swimming. The Mississippi is no longer a sewage dump! Bill is now a full partner in the bed and breakfast business. In December he had back surgery, expecting a four-month recovery and return to his work as a large animal vet. In February we learned that the four-month recovery was for the bone graft, and Bill will never return to his vet work. Luckily, spring came early and Bill got involved in “re-landscaping” our property. It’s amazing what can be accomplished when one can spread a job over several days and take regular breaks! Our son built a rock garden and Bill filled it with perennials (I’m still learning how to insert and crop pictures. This one didn’t do what I told it to do!). We’ve had an interesting experience helping friends get started in the bed and breakfast business. At a county zoning meeting I had the opportunity to speak in their behalf. One neighbor was concerned about heavy traffic and drunken parties. I was able to assure him that neither would happen. “In fact,” I said, “if you ever want to meet a fine string of people, open a bed and breakfast!” One of the commissioners was quick to agree with me! Okay, I’ve definitely made up for seven months’ absence, maybe several paragraphs ago. Be sure to visit the Wabasha-Kellogg Chamber of Commerce site for details on upcoming events. We look forward to sharing our River Nest with you! This entry was posted in Bird Sightings, The Area, The River Nest. Bookmark the permalink.